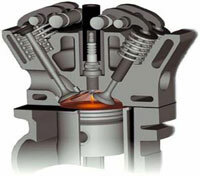 Basic function of ignition spark plug is to ignite the air and fuel mixture inside the combustion chamber. The resulting flame front expansion forces the piston from Top Dead Center to Bottom Dead Center. This process happens within 3 to 20 milliseconds depending on engine RPM. This piston movement is converted trough the connecting rod and crankshaft into rotating kinetic energy. Speed and the expansion characteristic of the flame front directly effects the developed mean pressure in the combustion chamber, which acts on the piston and is converted into power. But ignition spark plug is also exposed to a very challenging environment. The temperature inside of the combustion chamber reaches 2500 degrees Fahrenheit and the pressures reaching hundreds of MPa.